Bev and Frank Salomonsen of Rochester, Minnesota, built this balanced-lug sailboat from plans of the Tirrik design by Iain Oughtred. They built the 16′10″ hull from okoume plywood planking, with stem and keel of white oak. They gave the white oak and mahogany deck a varnished finish to show off the beauty of the woods used. 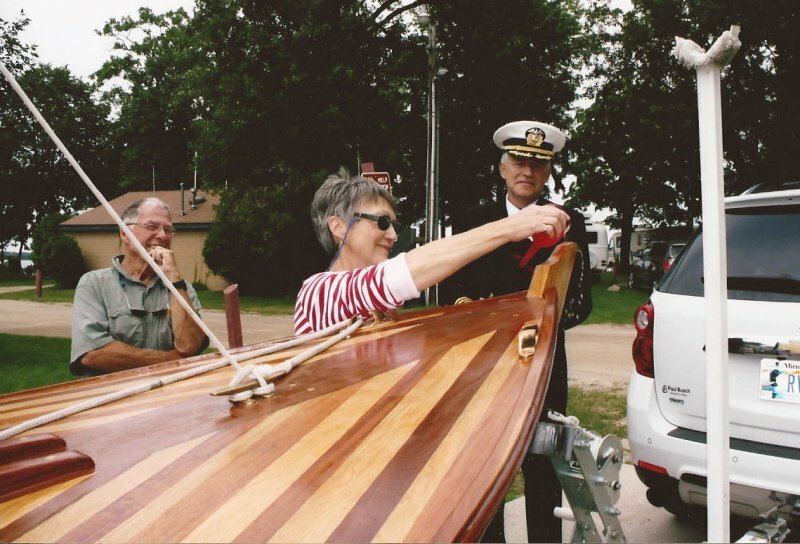 In this photograph, Frank, Bev, and their friend Captain Halvard Korsberg christen the boat NORSKA FLICKA last August at Leech Lake, Minnesota. You might see them sailing on any of Minnesota’s many lakes.